Leinster League, Carrick Mountain, Sunday 15th April: All set for our next event, planned by Valdas Tilunas, organised by Úna Coghlan and Kevin O’Kelly and controlled by Colm Moran, the event will start on the west side of Carrick Mountain, not on the Glenealy side. See directions below. 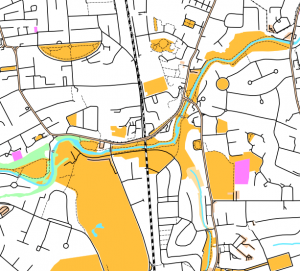 Maps will be on A4 waterproof paper, IOF symbol control descriptions, except for Yellow and Orange courses. Parking will be on forest roads and the start and finish are not far from registration/parking. 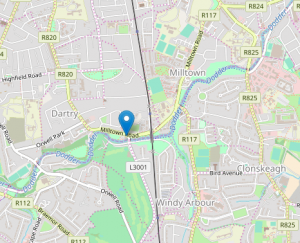 From the N11, leave at Junction 16 and travel to Rathnew and then Glenealy. Continue on the R752 through Glenealy towards Rathdrum for about 3 km and take the small road L2116 to the right just before the railway bridge. Be careful at this junction! Follow the L2116 for about 3 km and turn right onto an even smaller road for another 1 km before turning into the forest. Parking is about 2 km further into the forest. 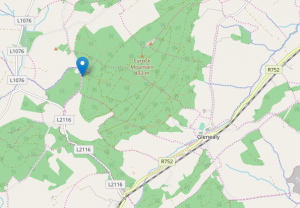 Do not attempt to access the area from Glenealy Village – it’s a big forest and you won’t be anywhere near the start. See map with forest entrance here. Last weekend’s Student Championships, changed from Killarney a few weeks ago, were run at the League event at Brockagh. UCD won the Ladies’ A class, TCD won the Ladies B class and UCC won the Men’s A. A steady run from 3ROC’s Clíona McCullough (TCD) wasn’t enough to catch the UCD girls (Aoife McCavana, Niamh Corbett and Róisín Long). The TCD trio of Josefine Klintberg (having her worst run of the season! ), Clíona McC and Caoimhe O’Boyle finished some way down on UCD. UCC were the only college to field a team of three in the Men’s A race (Dan O’Sullivan, Zac O’sullivan Hourihan and Andrew Turner). A big feature of all the courses was the amount of climb, but at least the weather was ideal and the bracken had largely been flattened by the snow. The World University Championships, by the way, are in Finland in July, in conjunction with the Finnish 5-Day. 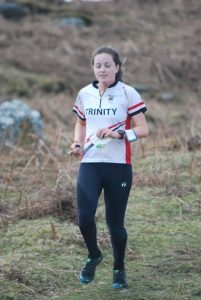 The best 3ROC result on Sunday was Mary O’Connell, 5th on the Green course. See results, Routegadget etc here. Irish Championships Relays: IMPORTANT If you want to run on a 3ROC Relay team at the Irish Champs, please contact us (3rockoc@gmail.com) before midday on Friday 13th April. Relay entries close on Sunday and we need to see who we have to make up teams. Individual entries also close on Sunday so make sure you are entered. There’s a big, international entry and it includes our first M90, Seán Rothery, having a crack at the first Irish title in that class. Seán was one of the first orienteers in the country, back in the 1960’s, and his sons Eoin and Colm (both now in Australia) have had distinguished orienteering careers as well. He also designed the simple, elegant and clever 3ROC club logo. Go Seán! The 3ROC AGM is on Monday 23rd April at the Dropping Well, Milltown. It’s important that you come as we have constitutional changes to vote on, and the cheques for our 2017 3ROC international team members will be given out. In addition, we’ll have a presentation on Open Street Map by Brian Hollinshead and Pat Flanagan. OSM is an international mapping initiative which can also be used to generate orienteering maps and it has opened mapping up to everyone. The map for finding Carrick Mountain here is an example of OSM, and so is the map for the Dropping Well here and the Street-O map made from it (below). Do come along and support the hard-working committee. And we need a quorum of about 20 people at the meeting to make it official! Remember you can pay your annual subscription online at Fabian4 just below. You should also remember to enter the 20th Shamrock O-Ringen, the three-day in Cork and Kerry at the beginning of June. See Shamrock O-Ringen. Invitation – you can join us or renew your 3ROC membership fee at Fabian 4 online here.